Positive Coaching Alliance advances the idea that responsibility lies at the heart of many of the life lessons that youth can learn through basketball. At the simplest level, each person on a team is responsible to all other team members for expending maximum effort, filling the roles needed for team success and upholding the team’s culture. While learning how to be responsible in a basketball sense, players also can learn how to apply those lessons in responsibility to other aspects of their lives, such as family, a school community and our society as a whole. 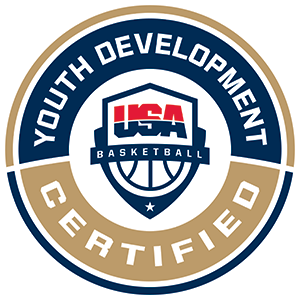 Coaches do well to make explicit to players the connection between basketball responsibility and rest-of-your-life responsibility. All the players should spread out on the baseline. 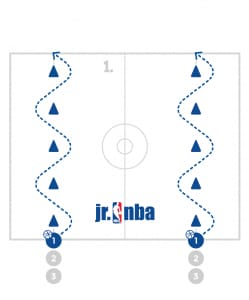 Each player will lead the team in a stretch or active movement from baseline to half court or back. Encourage the players to lead a stretch or movement that has not yet been done. This is a great way for players to develop leadership skills and gain comfort having a voice amongst their teammates. Have the players partner up and get 1 ball for the pair. One player will dribble the basketball in a stationary stance (dribbling in the manner the coach dictates). 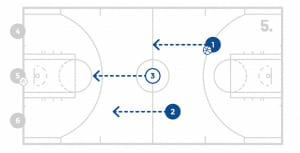 The other partner will give the dribbler contact by fouling the dribbler on the arms, shoulders, lower body etc. After the allotted time, the players will change roles and repeat. Ensure that the partner giving contact does so in a natural way that is productive for the drill. Encourage the dribbler to play through contact and maintain control of the ball. The partners will stand at least the lane width apart. The partner with the ball will start by pounding the ball and then passing it out to their partner with one hand. The pass should not be underhand, it should overhand with their hand behind the ball and their fingers pointing up. The partner will catch the ball with one hand and repeat the action back to their partner. The players should work at an intense speed. 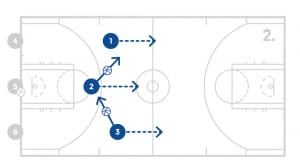 Change the types of dribbles leading into the pass to keep the drill fresh. Have the players partner up and get 1 ball per pair. One player will be the shooter and one will be the rebounder/passer. The shooter will stand in the paint around the block area. 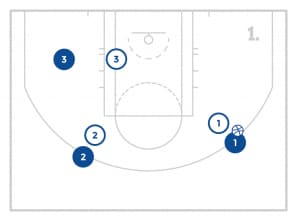 The passer will toss the ball up high to the shooter. 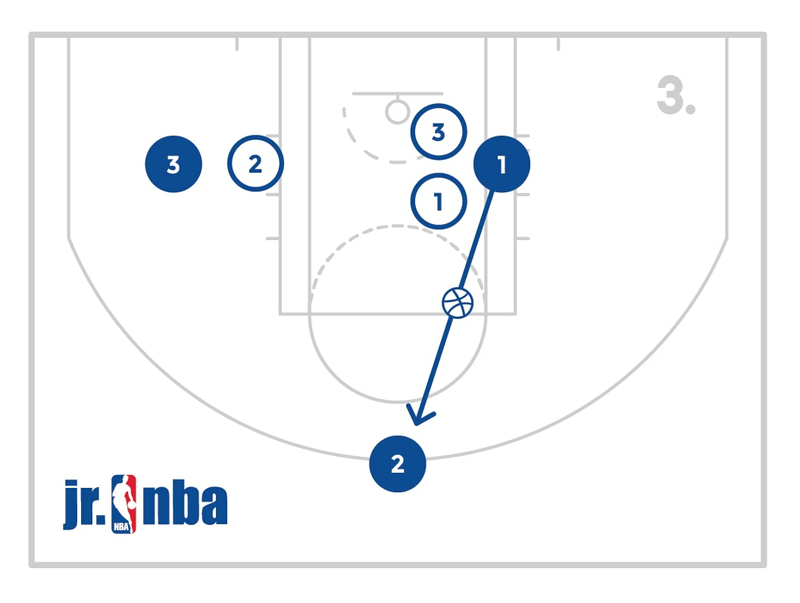 The shooter will jump and catch the ball high with arms outstretched. The player will keep the ball up high with their arms outstretched as they land. As soon as the player lands, they will quickly jump back off the floor with the ball high and shoot. The rebounder/passer will grab the rebound and quickly repeat the process until the shooter makes 5 shots. The players will change spots and do the same process. Make sure the players don’t bring the ball down when they catch it. 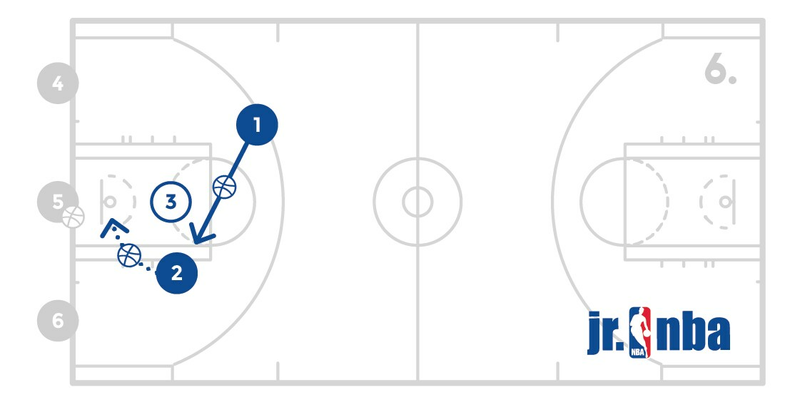 Have the rebounder hustle after the ball, and be sure to use multiple partners per basket to maximize space. 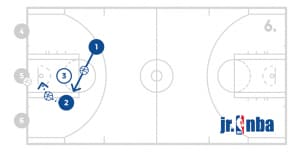 Have one player start with the ball under the backboard and the other player will stand directly behind them (between the offensive player and the basket). The player with the ball will take 1 dribble, will bump the defender back, balance on 2 feet, and go up strong to finish the basket. 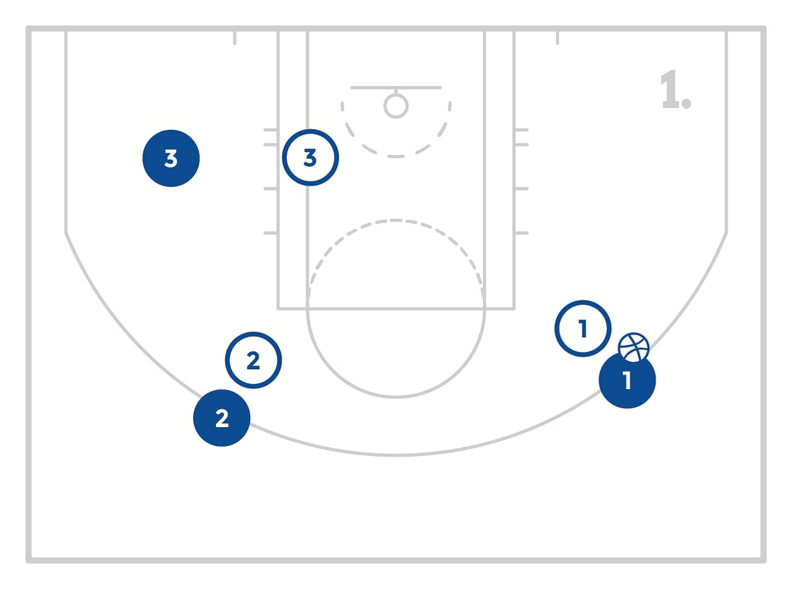 The players will repeat until the offensive player makes the allotted number of baskets. The players will switch positions and do the same process. Make sure to work on both sides. Make sure the player creates space by taking a power dribble and bumping the defender nice and strong. The player will need to be low, strong and balanced. Make sure they give themselves a good angle for the shot. 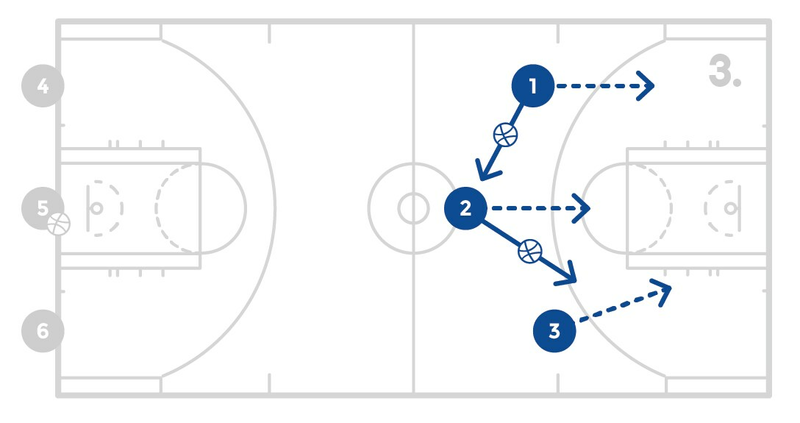 Divide the players into small groups and have a group on both sides of the basket. Use multiple baskets to get more reps. The first 2 players in each line will have a ball. 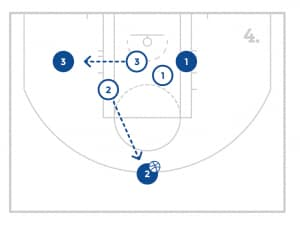 The first player will dribble to the basket and shoot the ball with their right hand if they are on the right side of the basket and the left hand if they are on the left side of the basket. If shooting with the right hand, instead of jumping off the left foot, the players will jump off their right foot. The same is true for the left side, the players will jump off their left foot to shoot with their left hand. Execute this for the allotted number of reps and change sides. 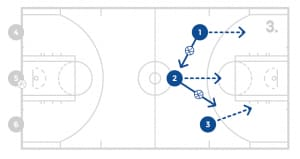 Help the players begin to feel natural with this style of finishing which may feel awkward for them at first. 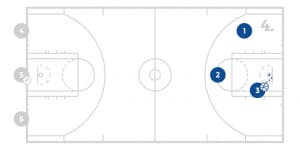 Have all the players start with a ball inside of half court on one side of the court or the other. 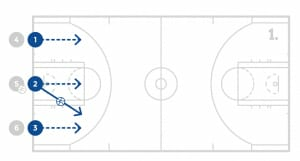 The players will dribble in and call-up/indicate that they want a ball screen (use a chair or a cone to act as a screener). The player will set up the screen and come off the screen assuming that the player that would be guarding them comes over the top off the screen but gets hit by the screen. 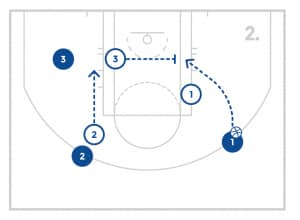 The coach will act the defender of the screener and either hedge the screen, drop back, or play between the two. The offensive player will read the coach’s defense and take the appropriate shot. 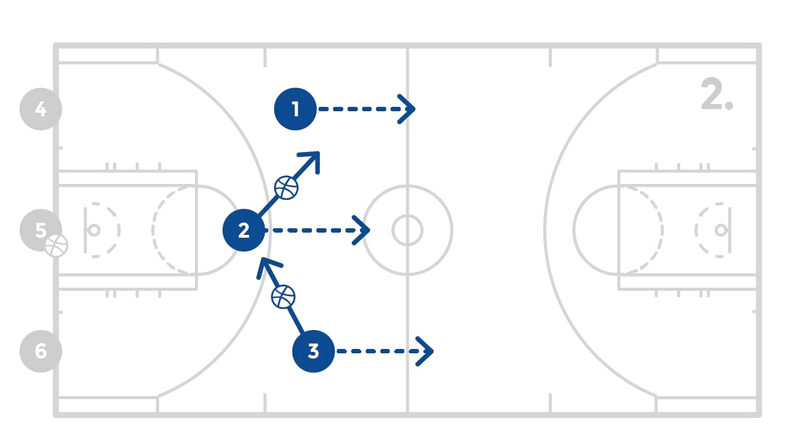 Work on coming off a pick and roll and reading the post defender. 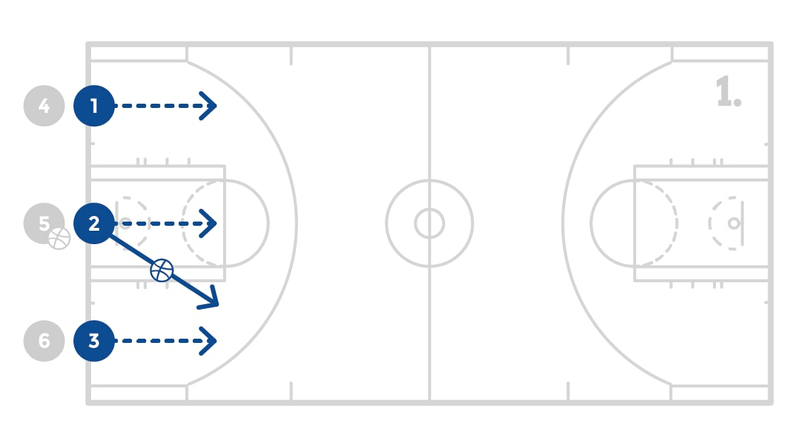 Have the players start in 3 lines on the baseline with 2 balls in the middle line. The first 3 players in line will run down the court passing the ball with the two side lines out wide. The player in the middle will pass to one side, receive a pass back, pass to the other side, receive a pass back, then pass to the first side. 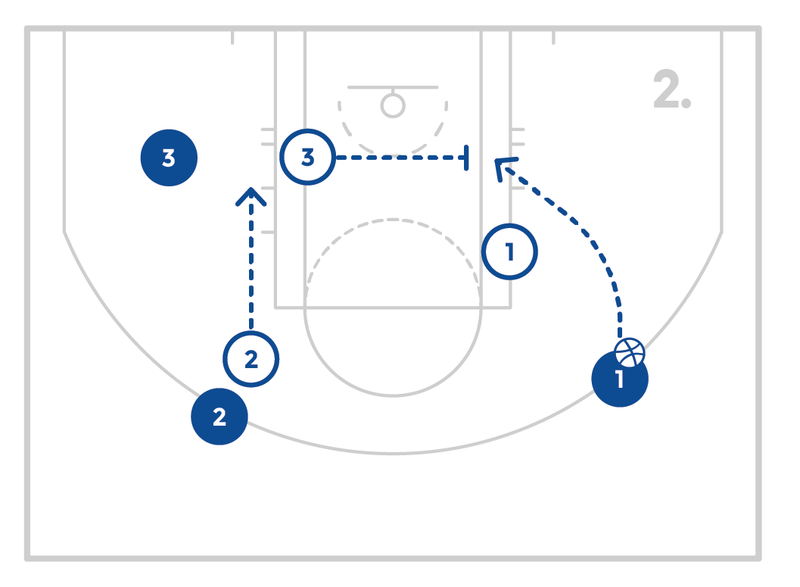 On this pass the player will take a layup. 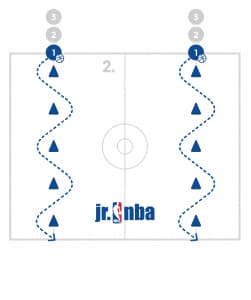 The player who laid the ball in will sprint back to the other end of the court as a defender versus the other 2 players coming back. The player in the middle is responsible for putting both feet in the paint and then becoming an offensive player going the other way. 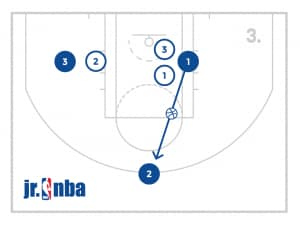 The player on the wing that did not shoot the lay-up is responsible for getting the rebound and then becomes offense going the other way 2 on 1. After 1 shot in the 2 on 1, they next group of 3 from the baseline will begin. Divide the players into teams of 3. 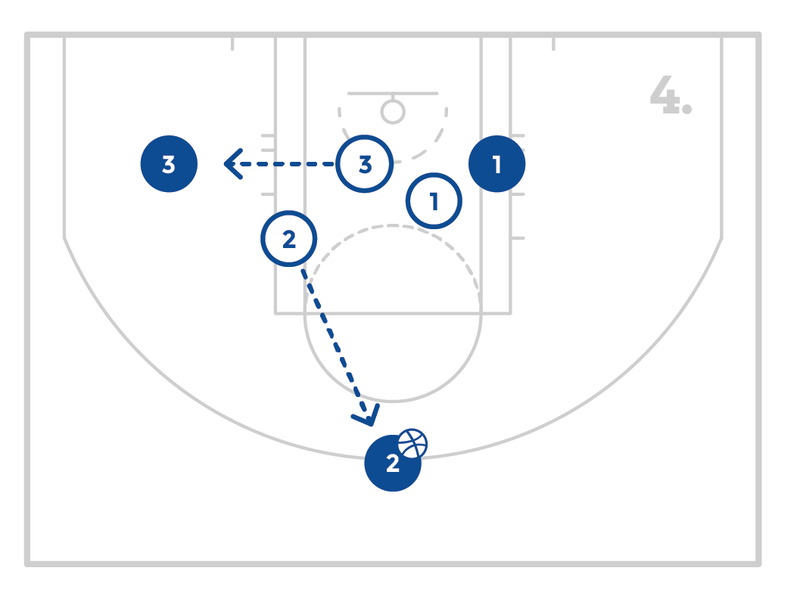 Utilize both baskets if there are four or more teams. The game must start with a baseline drive, a help player stopping the ball and the 3rd player “helping the helper”. The offensive player must kick the ball out and then the game is live and the players can move and play as they choose. Every change of possession, the ball must get back to the top of the key in order to start the next possession. If the offense scores, they get the ball back. Keep the game moving quickly but not requiring a “check,” and allowing players to get to the top of the key and start their possession.